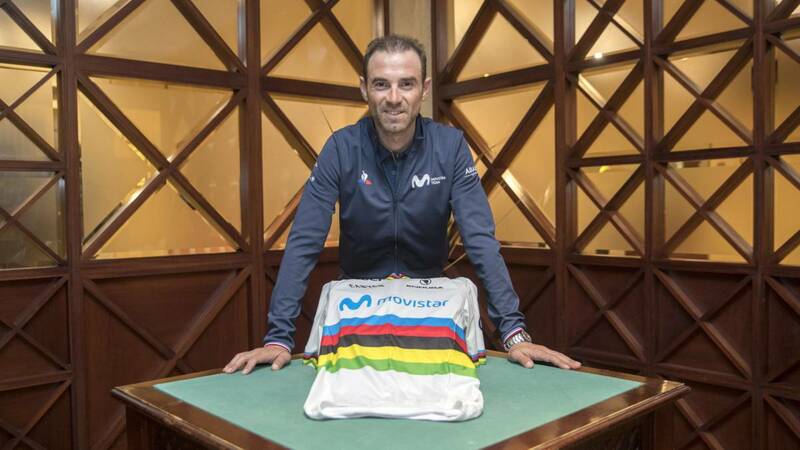 Home Cycling Valverde: "I love to hesitate from my rainbow with the grupeta"
Valverde: "I love to hesitate from my rainbow with the grupeta"
Valverde considers the World Cup "the culmination" of his career. A race in which he misses an Olympic medal. Here he reviews it with As. Ya takes a few tests as world champion. How do you feel? Fenomenal, very happy and very honored to wear the rainbow jersey. Although nothing can compare to the explosion of happiness that I noticed when I crossed the finish line of Innsbruck. That cry and that hug with Escámez (Juan Carlos, his friend, masseur and confidante). Ufff, he gets goosebumps when he remembers it. Of course, I do not look different except for having achieved that coveted title. I continue the same, with the same desire to train, to compete and to win. Do you respect more to a gold world in the peloton? Yes. I never complained about the treatment I received before, I was always respected, but I did get more people to congratulate me, and the greetings continued in Mallorca and Valencia, the first dates of 2019. On surveillance, I imagine it will not change. They marked me much earlier and they will control me a lot now. When you put on your jersey, are you aware of this magnitude? Does it impose on you and suppose more pressure, or impose on rivals and becomes a plus of confidence? At this stage of my sporting career there are few things that make me nervous. I would say both, since I know the responsibility that comes with wearing rainbows and yes it has given me time to verify that the adversaries look at you differently, as if you were more fearsome, although I do not feel stronger. The legs are what they are, and every day will be different. After a race to the hunt for the World Cup, with two other silver and four bronzes, does it look good mirror? Me looks good, right? I think I fit really. After six medals in which I caressed the title, the gold of Austria puts the icing on my palmarés. I reached the culmination of my life as a professional runner. Do your children know what your father has achieved? The twins (Alejandro and Ivan) do realize what I do and what this garment represents, and delighted ! Pablo, who is already nine years old, too. Travel from time to time to my competitions. The baby, Natalia, is still very small. Would you like them to dedicate themselves to your sport? Yes, why not? But I prefer that they decide what motivates them, what makes them happy. At the moment they play football, and they perform quite well. In some I have stopped them, because they get excited with the bike. I do not force them. That they study, that they take good notes and it will be seen where they leave. How do you worry about your education with so many days away from home? All my life has been like that. I try to stay as much as possible and I support myself a lot in Natalia (his wife). In the end, the family knows my work circumstances. It's about work, and you just have to try to comply at home and with Movistar. What do you want to instill in them? On top of all, discipline. That they know the value of things, that they know that it costs a sacrifice to achieve them. And that they be taken care of, that they take a healthy rhythm with studies and sports activities. Camino of the 39 years, you are a Spartan. Always. So I have prolonged my career here. Are you planning to continue beyond the 40, like Chris Horner? Ufff. Horner perhaps did not arrive so crushed to conquer the Vuelta at 42. I did not notice that longevity. I accumulate a lot of whiplash in the body. You have affirmed in several occasions that you intend to retire after the 40, after the Olympic Games of Tokyo 2020. Yes. I do not know if I will last much longer. I also do not know when I'll leave it, the exact date. I will not get off my bicycle in Tokyo, that's for sure. It will be checked as you say goodbye. Perhaps, I do not know. How do you motivate yourself to keep fit or shoot in bad weather with your palmares and your age? It does not cost me. It is not an effort to go out and train. I love going with the grupeta, and more with the rainbow jersey. Have a coffee, chat, joke. Obviously, you do not want at certain times, but then you pass. If you look back, how do you assess the two-year sanction for Operation Puerto? I value it in the way that I will not value it. I understand that do not want to talk, but being an interview as a world champion and his career, you should ask. Forma part of the past, that was left behind. Y if you look forward, what you still need to win? Probably, the games. I do not run to fatten the curriculum, but to disrutar and enjoy, to give the team victories. In the Ardennes, his favorite hunting ground, he has the thorn of the Amstel Gold Race. Accumulate five Arrows, record, and four Liege, to one of Eddy Merckx. In the global of the triptych also it takes a victory to him: ten to nine. No the sleep deprives me. If I conquer my first Amstel, welcome. If I tie with Merckx in Liege and in the total, welcome. I will go with the maximum ambition and the best preparation, as in each campaign. Hopefully it will go well and beat some. You can not change what has been done. The calendars were designed like this, and they did work for me. I have more medals than anyone in the World Cups, I won the 2018 and the Vuelta 2009, plus the stages and the podiums in the big three. I am not complaining, of course. Is it considered sufficiently appreciated in Spain? Yes. With my successes and my failures, it seems that the public fell well and the media have covered what I have achieved. Not everyone can aspire to the Tour or certain tests, nor enjoy some features that we would love. I try to behave with education. A normal, simple person. I think I have achieved many good things, and with closeness, naturalness and a smile you are happier for life.